'He's the hero Gotham deserves, but not the one we need right now. He's a silent guardian, a watchful protector. A Dark Knight.' 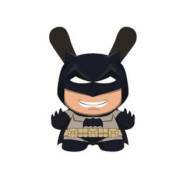 Batman lives again as Kidrobot and DC team up to present 5' tall Dunny figures based on The Dark Knight. Paying tribute to Christopher Nolan's gritty take on Batman these Dunny figures of Batman and The Joker receive the Dunny they deserve! BATMAN NINJA FIGMA BATMAN NINJA FIGMA CATWOMAN: NINJA VER.